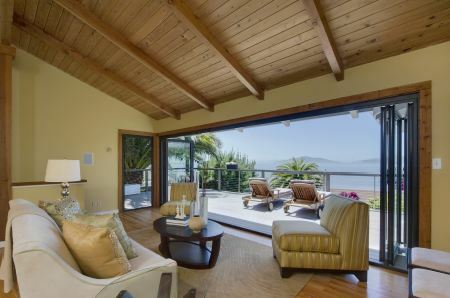 Stunning views are standard at 853 Ocean Ave.
What’s better than a home with a view of San Francisco Bay? How about a home directly on the shore, with a private, shared easement to a sandy beach? Our Home of the Week is a custom-built, contemporary jewel in Richmond’s Point Richmond neighborhood, meticulously maintained and an easy walk to the historic downtown district. The property offers sweeping views of the Golden Gate and Bay bridges, the San Francisco skyline, Angel Island, and beyond. The living room has a soaring, wood-beam ceiling and a free-standing fireplace, but the focal point is an expansive glass NanaWall that opens onto a newly built deck and a beachfront view, creating a stunning indoor-outdoor ambiance. At the rear is a chef’s kitchen, with plenty of windows that keep the rooms light and airy. With hardwood floors and impressive details throughout, the home has three bedrooms, including an exquisite master suite, and three bathrooms. The living room’s NanaWall opens onto a beachfront deck. Learn more about 853 Ocean Ave.